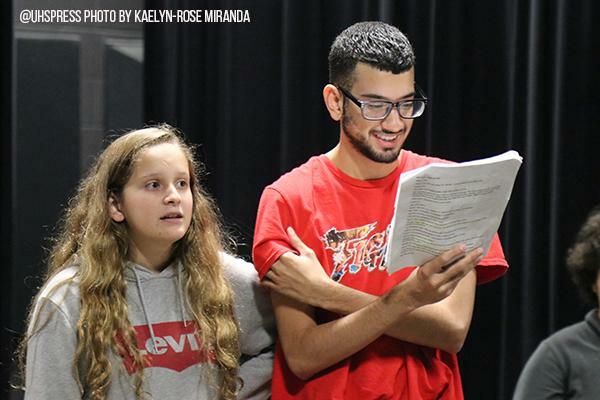 Behind the scenes, senior Edgardo Garcia and sophomore Jade Hoozky run through lines to prepare for theatre's one act. "Use your time wisely and plan ahead," Garcia said. They scurried onto the pitch-black stage prepared to run through their lines. A stage manager cued to brighten the lights and students got into character. On October 9 and 10, theatre students arranged their first one act of the year. They rehearsed lines and practiced blocking, when actors were directed where to move throughout the performance. With districts on the way, these rehearsals were the time to perfect everything for the performance, which took place on October 11-13. These performances allowed students to make note if their one acts made sense for the upcoming competition. Rehearsals become a handful at times with everyone doing a different job. However, these varying roles helped produce the performance. Each student relied on one another to remember their lines, and if someone made a mistake, there were others to help out. For students, theatre has impacted and encouraged them to be leaders to new students in the program. Kaelyn-Rose is dedicated to putting forward her best work. She is passionate about writing and loves to read. She is open-minded to learning new things and loves to accomplish goals.